I always thought it was strange how Rad Trads tried their best to turn Fat Festing into some sort of victim of the Pope. Hilary White + Steve Skojec + Ann Barnhardt + Maike Hickson + Michael Matt and others jumped on the Fat Festing band wagon. These same Rad Trads worship Cardinal Raymond Burke as one of their heroes. Looks like a division of sorts. Maybe Burke is no longer the Rad Trad Hero? 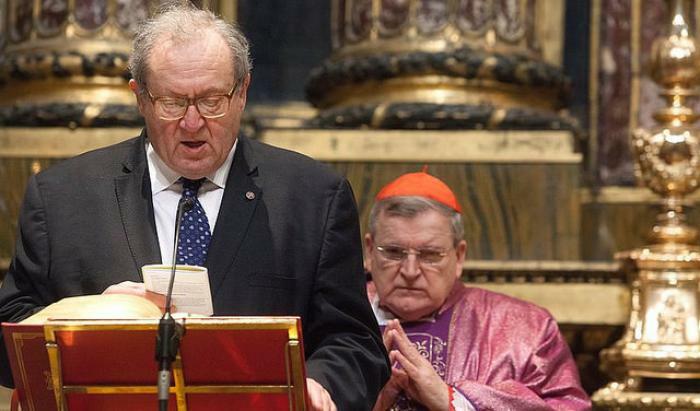 Cardinal Raymond Burke told the former leader of the Knights of Malta to tackle the issue of condom distribution or face a Vatican investigation, according to documents released by WikiLeaks. The files concern the constitutional crisis which occurred inside the order at the end of 2016 and early 2017 when a senior knight, Albrecht von Boeselager, was sacked for allegedly allowing the distribution of condoms. The Sovereign Military Hospitaller Order of Saint John of Jerusalem of Rhodes and of Malta is one of the oldest and most venerable institutions in the Catholic Church. Established in the eleventh century to care for pilgrims to the Holy Lands and to defend Christians during the Crusades, it has evolved into a major global humanitarian agency. Released on Wednesday 30 January, the Wikileaks cache of documents suggest that Cardinal Burke, the Patron of the Order, sought to co-opt papal authority by giving the then Grand Master of the Order, Matthew Festing, Vatican approval to remove von Boeselager as Grand Chancellor. 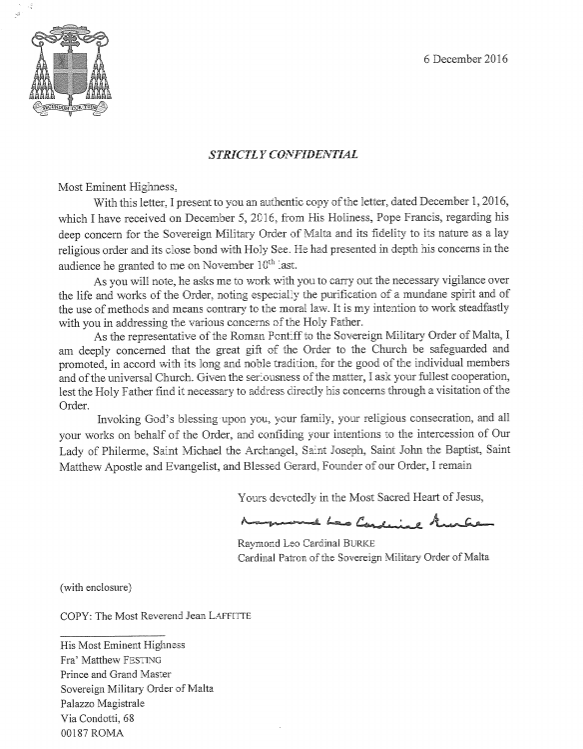 On 6 December 2016 the cardinal – whose job was to serve as papal envoy to the knights – wrote to Fra’ Matthew calling for his “fullest co-operation” in tacking the “use of methods and means contrary to the moral law”. If this doesn’t happen, the cardinal says, inside Pope would “find it necessary to address directly his concerns through a visitation”. But Pope Francis, in a letter released in the same cache of Wikileaks files, urges the cardinal to resolve the matter by following the principle of St Paul by “speaking the truth in love.” Contrary to the claims in the cardinal’s letter, Francis makes no mention of any visitation. The Pope, who is writing following a private audience with Cardinal Burke on 10 November 2016, says he would “be very disappointed if – as you told me – some of the high officers were aware of practices such as the distribution of any type of contraceptives and have not yet intervened”. He stresses, however, that the matter be rectified by being “discussed with these officers”, and the need to resolve the matter through dialogue was also reiterated in another letter from Cardinal Pietro Parolin, Holy See Secretary of State. Cardinal Burke’s letter makes no mention of dialogue or discussion, nor does it mention Francis’ concerns for the order engaging in “secular and frivolous behaviour” and joining organisations that are “contrary to the Catholic faith”. Since his time in Argentina, the Pope has been wary of the links between the Order of Malta and Freemasons, which Catholics are banned from joining. The Wikileaks files include “an alternative timeline of events”, said to have been “meticulously gathered” from “many different sources”. 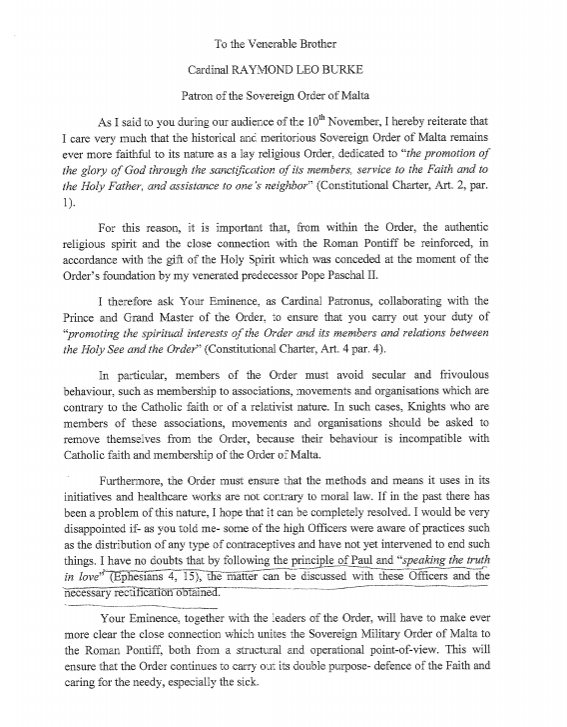 This reports that Cardinal Burke told then Grand Master of the Order of Malta , Matthew Festing, that if von Boeselager was not removed he would “instruct the Holy Father to initiate a visitation of the order”. On the 7 December 2016 Fra’ Matthew called a meeting of his leadership team calling for von Boeselager to be removed, but he was not able to convince a two-thirds majority of the sovereign council to agree. “In the evening, the events are reported to Cardinal Burke, who informs the Grand Master that the next morning one of three things will happen,” the events timeline state. The claim the Vatican wanted von Boeslegaer removed turned out to be incorrect, and the sacking sparked a Holy See investigation which eventually led to the Grand Master’s resignation. The Tablet has also reported that von Boeselager, later reinstated, was viewed as an obstacle to the vision that Cardinal Burke had for the knights, while the German Grand Chancellor’s reform-minded approach to the order’s governance clashed with that of Fra’ Matthew. Among the cache of files in the WikiLeaks documents are the findings of an inquiry commissioned by Fra’ Matthew into the distribution of condoms. It was conducted by Dr Neil Weir, Professor Luke Gormally, and Professor John Hass. It reveals an ideological opposition to the use of condoms in any circumstance. The report argues that the order’s charitable arm breached Catholic teaching for supporting aid programmes where condoms were used to prevent HIV/Aids, but gives no ground to authoritative voices in the Church who say that contraceptives to stop diseases spreading is morally licit. The authors write that the Catholic Church in England and Wales’ charitable arm, Cafod, has argued condoms can be used to prevent the spread of fatal diseases and uses “moral theologians” who are critical of the magisterium to justify its position. But the report authors appear to argue against themselves by pointing out that Cafod has drawn on the support of “many theologians and Church leaders” including Pope Benedict XVI, to defend its position. Benedict XVI had argued that it was morally licit for a male prostitute with HIV-AIDS to use a condom, while Pope Francis has said contraceptives could be used to stop the spread of the Zika virus. The former Grand Master has also revealed he consulted closely with the Congregation for the Doctrine of the Faith, including its former Prefect Cardinal Gerhard Muller, before going ahead with the dismissal of von Boeselager as his Prime Minister-equivalent. “I didn’t do all this on my own bat,” Fra’ Matthew told The Tablet. Sources inside the knights say the Congregation for the Doctrine of the Faith were consulted about the case but never presented the order with any documentation nor did they meet with the Grand Chancellor. 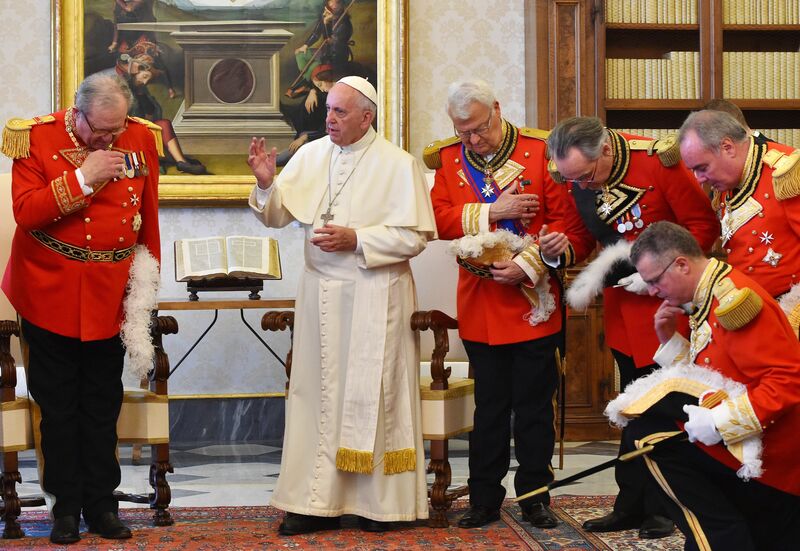 Cardinal Müller is also recorded as visiting the order’s headquarters to receive an award from the knights during Fra’ Matthew’s time as Grand Master. The former Grand Master says he was sure that both Cardinal Burke and the Congregation for the Doctrine of the Faith believed it was right to dismiss von Boeselager. Cardinal Burke is a prominent critic of the Pope’s moves to allow communion to divorced and remarried Catholics while Cardinal Müller found himself at odds with the direction of Francis’ papacy, which he has criticised for lacking theological rigour. Sources inside the order have told The Tablet that Cardinal Burke wanted the order – which has an extensive international network – to become a platform to promote his traditionalist vision of Catholicism. Through a spokesman, the cardinal “declined to comment” on these claims. When von Boeselager was sacked, however, he told friends he had been labelled as “a liberal Catholic unwilling to accept the teaching of the Church” and later, in an interview with The Tablet, the Grand Chancellor said the condoms issues was used “a pretext ” for his firing. In April 2018 the order elected a new Grand Master, Fra’ Giacomo dalla Torre del Tempio di Sanguinetto, as their new leader, and reform of the order is now ongoing. The Grand Chancellor said that updating the governance of the order, including ensuring the Grand Master governs more collegially, especially on financial matters, is now part of the reform agenda for the knights. “The general hope or goal is to make the order fit for the future. 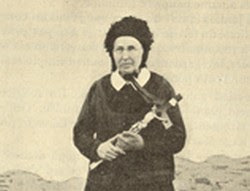 Over the last almost 1,000 years the order has been able to reform or adapt itself in the course of that history, because it remained faithful to its mission,” von Boeselager says. Von Boeselager, who had been Grand Hospitaller of the order, its charitable arm, says that when the condom distribution was discovered, he took action and has strenuously denied that he knowingly allowed it to happen. “We followed the teaching of the Church. I have repeated this several times. The condom distribution was discovered by Malteser International after an internal audit,” he stressed. The distribution, he explained, had taken place in three places. Two were stopped immediately while the other, in northern Myanmar, plans were put in place to hand the project over to another agency, which took some time. But the contraceptives were only a small part of a €2 million healthcare programme in a deprived part of the world known where prostitution was rife. Today, Cardinal Burke remains as patron of the order but is seen as “de facto suspended” from the role after the Pope appointed a special delegate, Cardinal Angelo Becciu, Prefect of the Congregation for the Causes of Saints, to handle matters concerning the knights.